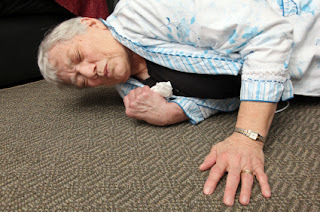 When an elderly person takes a spill, fast emergency response is key. If treated quickly, the damaging effects of a fall are far fewer, and the recovery time is shorter. How can you help insure that if you fall, you get the quick emergency response that is needed? Having the right tools to help you maintain a safe, but independent life is key. Should you take a fall, being able to contact someone for help, or put in an emergency call is important. While there are many services available for in home call buttons, what happens if you fall while out tending to your garden? Taking a walk in the early morning? Or traveling? Is there an emergency response system that is not limited by the confines of your home’s walls? A traditional emergency response pendant is going to work only in the home and sometimes only within a certain radius of the base. This is great if a fall occurs within these boundaries, but should the fall occur elsewhere, many emergency response systems would not be helpful. My Health Phone is a fully functional cell phone, which means it works anywhere there is cell phone service, providing greater range of use, inside and outside the home. Seniors are often shy of technology, especially when it appears complicated. This is why emergency response systems that are merely a pendant are so attractive. My Health Phone, while sophisticated software to provide so much more than just emergency response, is easy to use and intuitive. 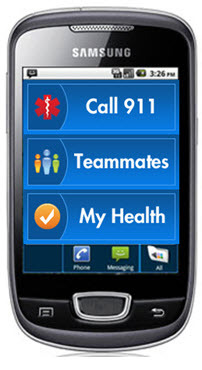 The phone is pre-programmed with a large help screen, making it easy to call even after a fall. When a senior experiences a fall or other emergency situation, having access to medical directives, living wills, HIPAA releases, and other important information will make the jobs of medical personnel much easier, and insure the senior has control over their treatment. My Health Phone offers complimentary access to Proximiti’s My Internet Lockbox service, which allows seniors to carry an Emergency Medical Information card with you that can give emergency personnel immediate access by fax or computer to your critical medical directives. In addition, these same documents are stored electronically and can be accessed via the phone. Having information such as blood type, allergies, etc. on hand and easy to access in an emergency situation can make a significant difference in the care. My Health Phone software can be easily configured to check-in with seniors, give medication reminders, etc. via text, email, or phone call. The caregivers are then able to set up automatic calls, texts, or emails to notify them of any problems, such as negative responses, or no responses from their loved one. However, it does even more, it also provides the ability for the senior to reach the caregiver when help is needed but 911 contact or emergency help is not. These messages can be pre-recorded and send with a simple push of a finger. This device not only provides for fast emergency response in the case of fall, but also helps seniors regardless of where they are, alert caregivers, and so much more. It is the Swiss army knife of emergency response systems.